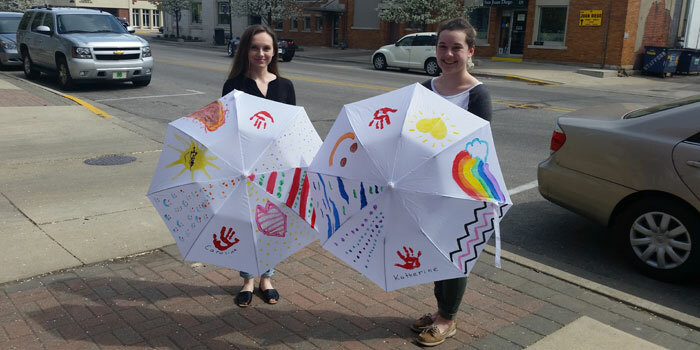 WINONA LAKE — Local teens Abigail Smith and Katie Yocum want to spread the word about juvenile dermatomyositis and its effects. Both girls are juniors at Warsaw Community High School. Just a few years ago, Smith began babysitting two happy twin girls, Katherine and Caroline. Not long after, one of the twins, Katherine, was diagnosed with juvenile dermatomyositis, an autoimmune disorder that affects the muscular system and makes the skin hypersensitive to sunlight. “One of the symptoms is, they can’t go out in sunlight because they get hives and rashes,” Smith said of JM patients. Because of this, Smith and Yocum are organizing the Parasol Parade. The program is through their participation in the Kosciusko Youth Leadership Academy. The event begins with sign-ins at 2:30 p.m. Saturday, April 30, at the pavilion at the park in Winona Lake. Participants will carry umbrellas on a designated path through the Village at Winona and around the island. At the end of the walk, they will gather in a group for a balloon release. Those wishing to get in on the release can purchase a balloon for $1, to be donated to the Cure JM Foundation. Registration will be taken up to the start of the walk. While early registration has ended, there is still a limited number of umbrellas available. Only the first 71 registered participants will be guaranteed an umbrella. After that, it will be first come, first served. Of course, participants are also welcome to bring their own umbrellas. A raffle will take place for two umbrellas, one decorated by Katherine and one by Caroline. The idea behind the umbrellas is to visually represent the fact that direct exposure to sunlight is dangerous for JM patients. The walk is expected to last about a half-hour and will be on paved sidewalks the whole way. Strollers are welcome. As Smith pointed out, because participants will carry umbrellas, the event will take place rain or shine. Of course, if someone forgets his or her umbrella, that person will still be welcome to walk. Participating in KYLA and co-organizing the event has helped Smith realize that, even though she is one person, she is capable of reaching out to many. Yocum, too, has felt a positive influence from working on this project. Those who do not wish to participate in the walk can still make a monetary donation. All net proceeds from the event will go to the Cure JM Foundation. Volunteers are also welcome for tasks like handing out balloons and umbrellas, marking the path and taking registration. To donate or volunteer, click here.